2019. Maus Contemporary, Birmingham, Alabama. Eugene James Martin, Nov. 8-Dec. 13 (Solo). 2019. Dix291 Gallery, Paris, France. Eugene J. Martin: Satirical Abstracts (Historical Drawings), Jan. 26-Apr. 6 (Solo). Curators: Myriam Bucquoit & Bernard Crespin. 2016. Eugene James Martin - historical works from the 1960s and 1970s. beta pictoris gallery/Maus Contemporary at Art Marbella-The Modern & Contemporary Art Show, Marbella Spain, July 29-Aug. 3 (Solo booth, Art Fair). 2015. beta pictoris gallery/Maus Contemporary at Summa Contemporary Art Fair, Madrid, Spain. Eugene James Martin, Sept. 10-13 (Solo booth). 2014. beta pictoris gallery/Maus Contemporary, Birmingham, Alabama. Eugene James Martin - Favorite Blues (solo show). Sept. 5-Oct. 31. 2013. ASC Projects at Gallery 304: Chelsea, NYC. Satirical Abstraction: Works by Eugene J. Martin. July 18-Sept. 30 [14 works of Art] (solo show). Curated by Ayn S. Choi. 2012. Masur Museum of Art: Monroe, LA. Improvisations in Time: Eugene J. Martin and the Masur Museum of Art. Aug. 4-Oct. 25 [68 works of art] (solo show). Click here for catalogue. Click here for Masur Museum Facebook exhibit album. Click here for exhibit video. Click here, here and here for Curator's Benjamin Hickey Sept. 20, 2012 lecture. Curated by Benjamin Hickey. 2012. Ohr-O'Keefe Museum of Art: Biloxi, MS. The Art of Eugene Martin: A Great Concept. June 5-Dec. 1 [39 works of art] (solo show). Click here for video. Curated by Barbara Johnson Ross and Denny Mecham. 2011. New Orleans African American Museum: New Orleans, LA. Dancing String Bean: Paintings and Drawings by Eugene Martin. Apr 6-Sept. 17 [29 works of art] (solo show). Click here and here for exhibit videos. Curated by Marie Vinouze. 2011. Louisiana State University Museum of Art, Shaw Center for the Arts: Baton Rouge, LA. For video click on Beyond Black: Ed Clark, Eugene Martin and John T. Scott. January 30-May 8 [16 works of art] (3 person show). Curated by Natalie Mault. Beyond Black in Contex, Gallery talk by Mora Beauchamp-Byrd, Feb. 3, 2011. 2009. 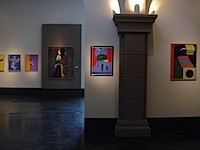 Cajun Spice Gallery, Lafayette LA: Eugene J. Martin: Spice of Life. Nov 14-Dec 10 [32 works of art] (solo show). Click here and here for videos. Click here for catalogue. 2004. Galerie Lafayette: Lafayette LA. The Gravy Train People and their Pets, Sept 8- Oct 19 [122 works of art] (solo show). Click here for exhibit video. Curated by Brian Guidry and Stephanie Patton. 1990. Michel Rooryck Gallery: Ghent, Belgium. Eugene Martin: A Retrospective. Jan 12-Feb 11 [49 works of art] (solo show). Click here for exhibit video. 2016. Profligate Beauty: Selections from the Collection of the Ogden Museum of Art includes 2001 acrylic painting on canvas by Eugene J. Martin, curator: Bradley Sumrall, New Orleans, LA (Nov. 19, 2016-Sept. 30, 2017). 2016. 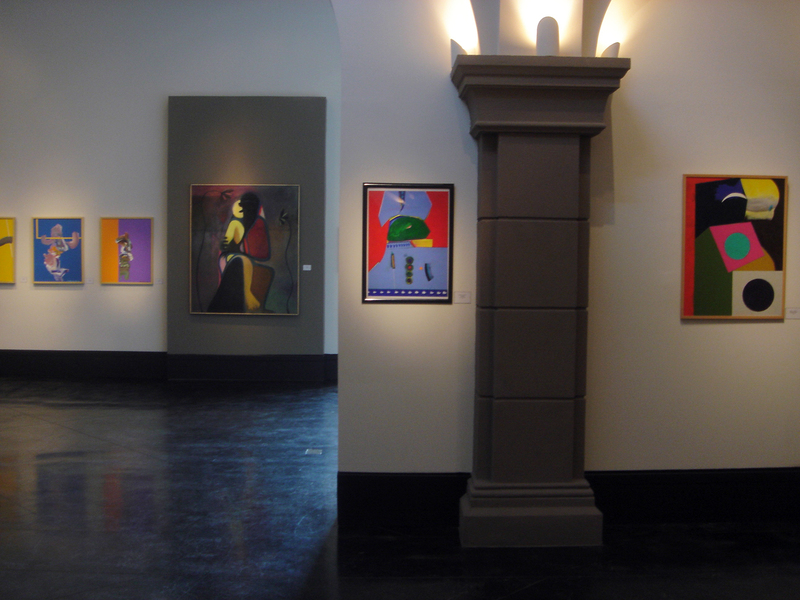 Bayou Moderne - 20th Century to the Present, LSU Museum of Art, Baton Rouge, LA: rehanging of permanent collection, includes 1990 acrylic painting on paper by E.J. Martin, curator: Dr. Sarah Clunis (May 12, 2016-March 7, 2017). 2015-2016. Recent acquisitions and Favorites, Masur Museum of Art, Monroe, LA (July 15, 2015-Feb 20, 2016). 2015. Many Rivers: A 40th Anniversary Celebration of Black Dimensions in Art, Inc. Arts Center Gallery, Saratoga Arts, Saratoga Springs, NY, Oct. 3-Nov. 14. Curated by Stephen Tyson and Stanwyk E. Cromwell [2 paintings on canvas]. 2015. Works in Paper selections from the Gallery, Louis Stern Fine Arts, West Hollywood, CA, July 31-Sept 19 [2 works on paper]. 2014. Clayton Colvin, Eugene James Martin, Leslie Smith III, and Odili Donald Odita. beta pictoris gallery (pp. 38-41), Volta 10 Basel, Switzerland, June 16-21 (Art Fair). 2013. Golden Anniversary: The Masur celebrates fifty years, Masur Museum of Art, Monroe, LA (June 26-Oct 5).